Frocktails is fasting approaching, I'm delirious with excitement. When I start talking about Frocktails, I get a silly grin on my face! I'm sure it will be better than what I dream it to be when I'm up feeding Ginger in the wee hours of the night. Longrain Melbourne for Cocktails, Dinner and Dessert. That's up to you! It could be great if we could all wear a dressy self-stitched frock, but that may not suitable for your lifestyle etc, as long as its made by you, you'll fit right in. There has been a lot of chat on twitter on what to wear or make, something to remember, make whatever you feel comfortable in! Everyone is an individual, so if you feel comfortable in a day dress or pants then make that, we won't judge you! My darling creation was born last week, 12 days overdue! Ginger arrived weighing 4.05 kilos, and 54cm long! His eviction orders were well and truly served. 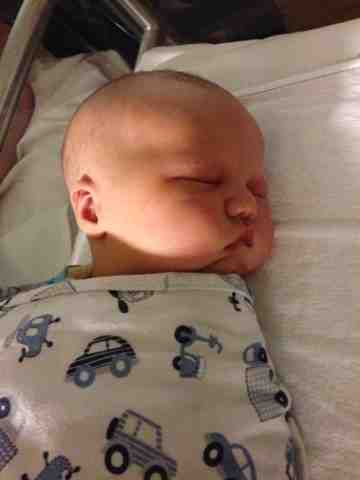 With the help of some powerful drugs, bought on his speedy arrival, in a 3 hours and 20 minute labour! We were home late afternoon on Thursday and we have been getting to know our little Ginger ever since. We having being marvelling at our beautiful creation. My heart breaks when I think about how much love I have for him. He is a lovely, happy baby, although he sleeps through the day and not the night, that's how he was in utero too so not much has changed. I'm sure you can see by the photo what cubby cheeks he has! They are even better in person, just great for squishing! I'm doing really well, and feel great, I haven't been counting the weight but on the day of his birth, I lost 5 kilos! I was happy about that. I have decided at this stage not to share his name on the blog. I'm going to take a few months break from blogging although not sewing, and will be back with new dresses and tops later in the year. Frocktails; fabulous is not optional. You are cordially invited to get your fabulous handmade frocks on, on the 7th of September for Frocktails. Bloggers and non bloggers are welcome! As long as you love to talk about sewing whilst clutching a fancy drink in hand, we will have a fabulous time! Starting at Longrain Melbourne for Cocktails, Dinner and Dessert. As much as you would like to spend. Please check out Longrains menu for a rough idea, on average, dinner and dessert will set you back about $65 per head. That's up to you! It could be great if we could all wear a dressy self-stitched frock, but that may not suitable for your lifestyle etc, as long as its made by you, you'll fit right in! Either leave a comment with your email address here, or email me at allegravintage at gmail dot com and I'll send a group email out with more details! I can't wait to see you in your beautiful creations! There may even be a best dressed award on the night! A big thank you to Molly, who suggested the name Frocktails! I have been waiting what feels like a lifetime, for Ginger to come out. I gave him his notice to vacate around 36 weeks. I have had quite a few serious chats about him coming out. It must be nice in there, tight, warm and comforting as I have had no response, not even an acknowledgment. We had hoped that he would be here by the 30th of April, but alas it was not to be. His due date was the 3rd, which I knew wouldn't happen, he would either be here early like his daddy or late like his mummy, but not on time! I spend my days wondering.... what he looks like, what personality he'll have, if he will be a Ginger! I desperately want a child with red hair. I spend my nights, awake. I now average about 5 hours of sleep but never before 3am. We can't wait to meet him, so hurry up Ginger and arrive swiftly and safely. PS there will be a nursery tour blog post soon but I've lost my sewing/craftyjo at the moment. PPS thank you to the lovely ladies who have sent emails to see how I'm going, you're the best! SewcieTea Outfit Maternity Vogue 1027. I agonized about what to make for SewcieTea for weeks, as I didn't want to make something that I would only wear once if it was going to be a maternity pattern as I'm in my last few weeks of pregnancy. Fabric choice also played a big part, again I didn't want to use anything special or expensive pretty much for the same reason. I blathered on to anyone who would listen, and put it out on twitter quite a few times, asking for pattern ideas. I still hadn't decided on Friday night then got out Vogue 1027, after my last day of work two days before SewcieTea. I cut out roughly 50% of the pattern on that night, until I hurt my back and had to lay down. I finished the cutting in the morning and sewed from till 3.30pm on Saturday. I spent another hour on Sunday morning, fixing little things and clipping all the threads off the dress. It took left that 24 hours to make this dress, I had frequent breaks as Ginger is getting in the way of the sewing machine. Which means it time for him to come out! If your ever pregnant I highly recommend Vogue 1027. Even if your not pregnant I still highly recommend it. Hats off to Donna Karan (or the person that actually designed this delightful pattern), I made minor adjustments to the pattern, the highlight to be was no FBA was needed, which in my eyes makes it a winner!! It has been well noted on many blogs that this pattern won pattern of the year in 2008 on Pattern Review. I can see why, oh and yes I love being behind the times. This is the third time I've made Vogue 1027 and it will not be the last. Took 2.5cm off the side seams on each side of the bodice. Took 2.5 cm at the top of the skirt grading out to 1.5cm seam allowance. Sway back adjustment of 2cm. Basted the cross-over bodice piece at 2 or 2.5cm. Used a twin needle to finish off the neckline and arms. Left the bottom of the skirt unhemmed. Why didn't I just cut a 10 or 12 instead of taking such big chunks out you ask? Well, because I thought I needed to allow more room due to pregnancy, however this was so unnecessary as the pattern has a lot of ease and the fabric had more stretch that the two previous versions I have made. Next time whether or not I am pregnant I will cut out a 10 or 12 depending on stretch of the fabric. The fabric was purchased from Spotlight either very late last year or very early this year, I bought 3 metres, and have over half a metre left. The fabric has a lovely floral print, is very light and slinky. Some negatives about it, is it almost 100% poly, which made wearing everyday underwear difficult and there is no breath-ability in the fabric. I'm not sure I would make this again in a poly but I am eager for a cotton, bamboo or wool based fabric. Wool jersey fabric is currently calling my name, but I am trying to resist buying more fabric! All in all, this is one of the best patterns I have worked with, I see myself using this as my tried and tested pattern for many, many years. Lara made Vogue 1027 to wear to SewcieTea, I love how it turned out for her, I will be adding elastic to the neckline of my next versions as I think it is a tidy finish, and makes the dress sit well. Oh and she hemmed her skirt. Even if I had the time, I haven't had a hem that didn't buckle with a twin needle, any ideas what I am doing wrong? I had a delightful time at SewcieTea, and I vote we do it twice a year, and visiting various locations around Melbourne. It was lovely to meet many new faces and some rather well known ones, like Julia and Lizzie! I'm so glad we all made the effort to be there on the day - it was lovely to talk to everyone. Unfortunately as I was talking so much I actually didn't eat much, I was so disappointed when I realized. I saw some absolutely amazing outfits on the day - I actually didn't expect anything less. My top 4 favourite dresses were in no particular order. Mindy's beautiful yellow vintage vogue pattern, that girl can certainly pull off the vintage look! Sarah's Eliza Dress, Sarah did that dress justice, she hand basted and everything. Its such a beautiful dress. Rachel's Liberty dress, all I can say is Wow! The dress is even nicer in person than in photos, and the fit is perfect. Jenny's red Va Va Voom dress, I couldn't stop looking at it, that dress is gorgeous!! If you're interested in coming out for Frocktails please keep September the 7th free from 6pm onwards. I have almost picked a venue which is located in the heart of the city, which will make transportation options easier. Look out for more concrete information in May, feel free to plan away for the perfect outfit! We welcome interstate visitors for Frocktails- if you need a lift from the airport I will doing a pick up around 10am on Friday. The ever lovely Amanda from Bimble and Pimble and Kirsty from RocketSew are coming in then as we are making a weekend of it. I plan on having a baby free weekend, Ginger will be 4 months old around that time, I'm so excited! I think Ben is slightly scared. Baby shower and Vogue 1027 Maternity style. A few weeks ago I had my baby shower, my wonderful sister and a good friend hosted it for me. It was an afternoon tea party, as afternoons are my favorite time of day. Naps and food such a wonderful combination! This was hands down the best present that I got on the day, my face was covered by the quilt, as I was choking back tears! Thank you again Melanie, Sarah, Rachel and Belle!! I am a lucky friend to have you all go to so much effort for me and ginger. It goes perfectly in the nautical themed nursery. I chose to make Vogue 1027 for the shower not a maternity pattern but I knew it would work. It was the first knit dress pattern I ever bought, both the pattern and fabric were from Clegs, I believe the fabric is a slinky poly mix, that you can buy for round $8.95 or $12.95. This was not an expensive dress. I bought 3 metres and had a bit left over. You can see from the photo that I have pinned the bodice, I didn't need to but I didn't want to flash anyone. Also I am wearing the wrong bra with this dress, years on it still bugs me. Pregnancy related, I have been feeling surprisingly good, although I keep forgetting my stomach is so large, I keep hitting/ bumping doors on myself, Ginger does not appreciate it. Morning sickness stopped in very late December so I have had a good few weeks! I can't wait for the baby to be here so I can lie down comfortably! Me in Vogue 1027, and Rachel in her self drafted dress. This was packed away after the pregnancy ended. If I was to make it up for normal wear, I would cut two sizes down and take 10cm off the hem. Whilst I was planning the sewing social, Suzy from Suzy Bee Sews emailed me, telling me she would love to join us, and she would like to gift me a quilted cot blanket for Ginger. Needless to say I was delighted, at prospect of meeting her and the lovely gift, I've seen quilts being made so I understand the time and effort that goes into making one. Suzy gave me the quilt on the day of the sewing social fabric trip. I have to say how much I love this quilt, the colours are much brighter IRL and they are a perfect combination, the green really pops with the navy which is my all time favourite colour. The back has a really interesting feature so if Ginger is sick on one side, I can just turn it over and it's still interesting, just joking. I can see this quilt becoming very handy and I have had a few compliments on it already. I just want to say publicly a big thank you to Suzy, I love the quilt and you are an extremely generous person. On the same day as Suzy gave me the quilt, Kirsty from Rocket Sews surprised me with this gorgeous sailor outfit! The outfit fits in with Ginger's nautical themed nursery, which is coming along swimmingly. You can see better photos on her blog here. The size is 00, which will hopefully last him a while. Kirsty also sent the pattern which is by Burda, two pieces of lovely fabric and some buttons in the mail about two weeks later. I've managed to cut out the bottom for Ginger, but haven't gotten that far as I need to buy thicker elastic for the band. I have plans to make the outfit in navy cotton sateen, with white buttons, hopefully he won't look to OTT. I have been really touched by the effort that my lovely sewing friends have made, I have one more present to share, which you may of seen, which will be in a later post when I blog about my baby shower and dress. Look out for little thank you present in the mail, Kirsty and Suzy. Scar update: Just in case you're wondering, after two infections in my scar, it is healing up nicely although it is still purple, hopefully another month or two and it will be completely healed up. What not to do at social sewing. Warning this post is not for the faint of heart or squeamish. If this is you, please do not read below, think of prancing unicorns in a field of pansies or something similar. All fun and games until someone gets hurt. Last Saturday morning I was at GJ's for the social sewing, having walked to Rathdowne and back with Sarah and Jennette to see if I could use my scoopon. As I was making up the stairs, I was dragging my sewing trolley case to the room we sew in, one third of the way up, I decided to carry it instead of dragging it as it felt unsteady, I knew the base poles popped out now and again, however what I didn't realise that they had come loose and were dragging on the floor. As I swung it up passing it over from my right to left hand, I felt the case poles scratch at my left leg, and then catch on my dress, inhibiting my movement up the stairs, I looked down at my leg as I thought I had scratched it, to my alarm I saw open skin, but at this stage no blood. I called for Rachel, using a normal voice not really alerting anyone to my issue. I became extremely hot, and started sweating (I know I'm a fainter in certain situations). I started calling out again, to her and to anyone for help. Some staff came to assist us, they made me sit down, someone suggested calling an ambulance which I believed I scoffed at until Rachel piped up and said "no, I think you need an ambulance", I looked at my leg and then started agreeing with all of them. I needed an ambulance as the cut on my leg was not a scratch is a was a gash! A great big bloody 10cm by 1cm gash, and boy was it a bleeder! Angie and the staff were fantastic and GJ's first aid kit is so well stocked, if you have to injure yourself you might as well do it there, as they provide great help. In all seriousness, please don't. Vanessa and Grant were the paramedics that took me and Rachel (who selfless volunteered to come with me) to St.Vincents hospital (shortest waiting time) they were lovely and very helpful, and I was grateful to have them there assisting me, I think paramedics do a wonderful job. I have never ridden in an ambulance before, I didn't really enjoy myself as much as I thought I would, I could feel the adrenaline fading once I had to lay down. I got given some horrible pain medication to snort up my nose, it did nothing except make me feel sick. Once we got to St.Vincent's we had to wait about 3 hours to see a doctor, I think I would of left, if it wasn't for Rachel, who kept me entertained and fed, I can honestly say I will never knit but I can certainly see the attraction. We have both agreed she has done her allotted time waiting in hospitals for the year. Once we were in the emergency area, we waited a further hour for a bed, I was a little frustrated with how long the staff seemed to be taking, as I was well and truly over hospitals, waiting areas and wounds by that stage, I can only imagine how Rachel felt. We finally got a bed and within half an hour I was well and truly stitched up, although I got jabbed about 6 times with a local anesthetic to numb my wound. That was painful! I had bottom stitches and 10 surface stitches as it was deep cut. Do I look as uncomfortable as I feel? No whale comments, please. Patched up and ready to go. By the time the doctor had finished stitching me up, Rachel had rung a taxi and we were almost out of there! I got my letter for my normal doctor and caring for my wound instructions and then BAM, we were on our way to Rachel's house to the social sewing ladies who were going swimming at Rachel's place, more than 5 hours after we arrived. I have to say how happy I was with how I handled myself, a few people have commented about me being so happy, not freaking out etc while at GJ's, but to things into perspective, I knew I wasn't going to die, and more importantly that Ginger wasn't in any trouble, I could still feel him moving about and I was a bit high on adrenaline. The social sewing ladies were particularly helpful, cracking jokes etc and keeping me happy. What happened has happened, it could of been much worse but I'm thankful I at least get a good story out of it. There is always the next sewing social month!! I promise not to injure myself! Woo, see Rachel's blog for dates. Rachel - that girl is such a good friend, helping me out big time and didn't complain when wasting 5 hours of sewing time by spending it with me. Sarah - for taking my over locker out of my car. Melanie - for not fainting, she was looking mighty green and very horrified. I think it was best for everyone that us that she didn't accompany me to the hospital. - Love you Mel! Oanh - for giving us lollies to take with us. The lovely ladies at GJ's Fabric who were fantastic and very helpful. The social sewing ladies are the best and I'm so glad to have them in my life! Are we all bursting with excitement for the shopping day tomorrow? I know I'm looking forward to it. -I have changed one of the store on the list, we will no longer be going to Franke Stuart, it closes too early and I feel we would better off visiting Astratex on lennox st in Richmond as they are having a 50% off sale this week only. Trust me, if you like high quality Italian fabrics, you need to visit this store. They have this sale twice a year only. Amanda, Belle and I popped in late this afternoon, I was insisting that I was going to drop them off, and leave for my baby appointment, I stayed for the entire visit, it was a lovely store with great stock. Amanda fell in love with some beautiful dove grey wool angora fabric which she left behind, I did try to get her to buy it however she foiled my evil plans! -Melaine is leaving us for dinner, she has a hot date :P, so if you are in her car you will need to find your way back to GJ's if thats where you have left your car, I am happy to take people back on my way home, but as I'm pregnant and I get tired easily, this maybe earlier than you might like. We are going to the stores in this order, if you would like to know where we are at any given time, comment on this post or text me for those who have my number. I would suggest parking your car at GJ's then walking the 300 or so metres to Rathdowne. Find a park for your car and walk to the Button shop & Cutting Edge. 9. Alannah Hill, fabric section is upstairs, two doors down from The fabric store. Remember we are leaving for Darn cheap at 9.45 from GJ's/ Rathdowne at the latest so please be punctual if you are departing with us. I think that is all I need to say for now, hopefully I haven't left anything out! FYI Rathdowne Fabrics & a Scoopon Deal. Just thought I'd write a quick post to let you know a great deal I saw via twitter about Rathdowne Fabrics & Scoopon. This would make a great present - I'm hoping my sister will take my email as a hint and purchase one for my birthday day! I got the below from the Scoopon website. Upgrade to a $100 spend for just $30! 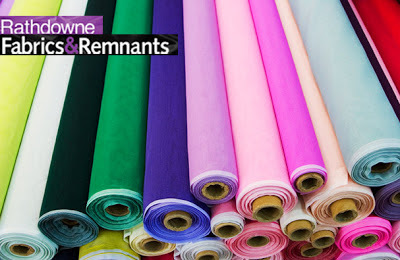 Official fabric suppliers to Project Runway Australia! Extensive range of remnant pieces available too – great for quilting and crafting! Get up a Scoopon for yourself and another to give as a gift! You more than double your spend and save 70%! You have 6 days left to buy the vouchers. Social Sewing goes on the road. Come one, come all to a day of fun, fabrics and fancies notions. Darn Cheap They have a great habby and trimming section! Then onto Rockwell's and son for dinner and a good old catch up. If there is enough of us, we can do a set menu, but we'll wait to see if how many people will come. Date: Saturday 9th of February. we will be leaving for our next stop between 9.30-9.45. What to bring: A good attitude, cash and or cards, light snacks and water. Any patterns etc that may help with fabric purchases. RSVP: No later than 5th of February. Either by commenting or emailing. The idea is to car pool as much as possible, please email me allegravintage@gmail.com if your interested in driving or if you need a lift, or if you just want to say hi! Note: I haven't allowed a lot of time at GJ's or Rathdowne as most of us have been there before or regularly, however as we have a few interstate visitors attending, I would like them to see both places. I don't have a set time limit for each place we visit, I'd prefer the day to be fun and relaxing, Rachel has put together a timeline and I will make a list of the addresses if you want to drive yourself, just let me know if you would like a copy. I hope you all can make it to part or all of the day, I think it's going to be a blast! Well what a year 2012 was! For me it was so much better than 2011, in almost every way, I am a much more happier person with less stress in my life. I got a better (stress free) job, I work with lovely supportive people, who really know how to bake! My husband, Ben has been so good to me, not only in the last year but the 6.5 years we have been together, I don't know what I ever did to deserve such a loving man, who has been so supportive while I have been experiencing the "joys" of pregnancy. I have made new friends, who all have an interest in the same area I do, sewing! Thank you to Rachel of Boo dog and Rachel of My Messings who organized social days. I hope we get to see even more of each other in 2013. Below are some of the goals, I jotted down recently that relate to things I've talked about on my blog. Use the patterns I have, try not to buy more patterns. Hold the social sewing fabric shopping trip. Blog everything that I finish - doesn't sound that hard but I am terrible with this. I have over 10+ things that I've finished and never blogged. Reply to all comments left on the blog minus the spam. Hold the night of cocktails & frocks. The event needs a better name, any suggestions? I have a few other things to add but this is enough for now. I hope everyone has a fabulous 2013 and I look forward to seeing all your beautiful creations!